Review Summary: More of the same. After 2005’s commercial smash and new emo-pop standard Move Along, a record that gave birth to three ubiquitous top 20 singles and a legion of teenage-girl fans, Oklahoma’s most cheerful rockers had nowhere to go but down. Enlisting Good Charlotte and Smash Mouth producer Eric Valentine and releasing the album more than three years after Move Along, an eternity in the Billboard world, singer/bassist Tyson Ritter and Co. brandish their inner arena-rockers on When The World Comes Down. It’s a record that never fails to retread the same hit factory path of Move Along, one that proves that the soul of a Rejects record is simple, sugary pop songs and choruses that refuse to stop their ceaseless racket in your head. First single “Gives You Hell” harkens back to the pop goodness of earlier AAR hits such as “Swing, Swing” and “Dirty Little Secret,” with a deceptively straightforward hook and a universal lyrical message; here, Ritter is spewing venom at the universal ex of all “that’s-what-you-get-for-leaving-me” pop songs, something even those who aren’t banking millions as frontman for a multi-platinum rock group can relate to. Alas, opening song “I Wanna” has enough cringe-inducing lyrics to fill a Mariah Carey song (“I wanna touch you / you wanna touch me too”) and Ritter’s delivery is bored, at best. It feels as though AAR is tired with this same old song-and-dance routine, and “Fallin’ Apart” attempts to spice things up with a well-placed string-and-piano rhythm and just the kind of chorus we expect from the boys: loud and arena-ready, background voices wailing in harmony included. For the most part, however, producer Valentine keeps to the same old tricks in his bag of pop-punk chemistry: guitars chime and fuzz out in all the right places, vocals are polished to a nary-a-crack shine, and the band packs enough animalistic, instinctively catchy hooks in the songs to snare any hormonal teenager. Hear Ritter proclaim his love at the end of the world (“Mona Lisa (When The World Comes Down)”), hear Ritter mourn a broken heart (“Breakin’”), hear folk duo the Pierces duet with Ritter about (what else") youthful love on “Another Heart Calls.” If nothing else, AAR is intensely focused on their key demographic, and while the lyrics are nothing but your standard yearning fluff, they certainly know how to drive a theme home. For all its radio-ready glory and single-ready marketability, there are a few hopeful signs of growth on When The World Comes Down. The aforementioned “Another Heart Calls” is actually quite a piece of mood work, beginning with a haunting “Enter Sandman”-esque guitar lick and a pounding tom-tom rhythm that calls to mind “Move Along”’s epic beat before erupting into an appropriately cathartic electrified chorus replete with grandly arching strings. Bombastic" Certainly, but the vocal interplay between Ritter and the Pierces is an album highlight. Bonus track “Sunshine,” meanwhile, is all plucked-stringed violins and glockenspiels framing a buzzing guitar and a straightforward lyric that throws metaphors and subtlety to the wind: it’s a song that works on a purely musical level, and is a refreshing change of pace from the previous guitar-oriented pop hits. When The World Comes Down could very well have been simply titled Move Along Part II, or something along those lines, as its penchant for right-to-the-heart power-pop, unadulterated, sickly sweet sentiment, and flawless production fit right in line with that album’s Warped Tour mindset. It’s an accessible collection of poppy tales of love won and love lost, a combination of primitive hooks and the kind of lyrics that draw longing teenagers like moths to a flame. Unfortunately, it’s not much else, and while the All-American Rejects are well on their way to establishing themselves as the torchbearers of today’s radio-listening emo youth, they show only a little tendency to grow beyond the limitations of their chosen genre. great review. used to like these guys´debut. haven´t heard it in ages, though. Good Review. Your comment on "Another Heart Calls" having an "Enter Sandman" guitar lick isn't exactly something I heard I must say. Another Heart Calls is easily the best thing they've ever written and I enjoy the rest of this record, but it's hardly anything special. Some friends were listening to 'Gives You Hell' and it was terrible. I didn't know it was the All-American Rejects, and although I don't have high expectations for them, I'm sad they made and successfully marketed something so poor. At least theres nothing on here as wretchedly bad as "Swing Swing"
I wouldn't say that. "The Wind Blows" is probably one of the worst single choices a band like this could have made. I love the intro to "Fallin' Apart." If it stuck with it instead of all the sudden reverting back to it for the last 10 seconds, acting like it's been a theme of the song the whole time, then the song would be great. That's about all I found here tho. Following the excellent 'Move Along', The All-American Rejects shake things up on 3rd LP 'When the World Comes Down'. With greater ambition, this is less accessible than its predecessor, but the quirky nature does shine through after multiple listens. Tyson Ritter overcomes his previous pitch problems with a laconic lower register, although his lyrics still require work. While best when it is upbeat, the teaming with The Pierce Sisters on 'Another Heart Calls' is an unexpected master-stroke. Consistency is an issue, but there are still more than enough hooks to go around here. 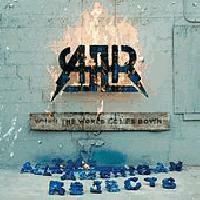 Recommended Tracks: Another Heart Calls, Gives You Hell, Real World & Breakin'. Garbage album and I normally like lovey-dovey pop-rock stuff like this. Only decent song was "I Wanna..." everything else is not even worth listening to more than once. I would go off and vent more to say here about this terrible album but, alas it's not worth it. Take my rating for it.